The Flight Jacket is also unique in that it’s essentially a sleeve-style case, but it has storage and carrying options not found on most sleeves. So while it can carry more than just your laptop, it's still slim and compact—enough so that you could put it inside another bag. The main pocket of the model I tested fit a MacBook Air perfectly; although the Jacket offers no rigid protection, this pocket is lightly padded and lined with soft fabric. Just in front of the laptop pocket is a smaller Velcro-closure pocket large enough to hold cables, an AC adapter, and other non-bulky accessories. A thick, Velcro-closure leather flap covers both pockets; the front of this flap provides its own small, zippered pocket. On the back of the bag is a thin pouch for magazines, folders, and other flat items. Perhaps my favorite feature of the Flight Jacket is a removable, 6.5-inch square pouch on the front of the bag. 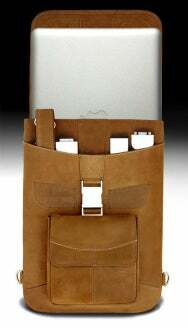 Made of the same leather as the rest of the bag and also lightly padded, this pouch is made to fit the MacBook Air’s external SuperDrive; it can instead be used for your laptop’s AC adapter and a few other small accessories. The pouch has a Velcro-closure flap, and attaches to the bag via a sturdy, attractive, stainless-steel buckle. When you want to travel light, you just unclasp the buckle and the pouch slips free. It’s nice to be able to leave some of your weight behind without having to empty part of your bag, and the design is very well done: the bag’s main flap covers the buckle, so when the pouch is attached, you can’t tell that it detaches, and when it’s not attached, you can’t tell something is missing. The Flight Jacket offers several carrying options. There’s a leather handle on top (attached to the body of the bag, not the top flap—too bad more bag makers don’t get this). There’s also an adjustable-length leather strap with sturdy, rotating clips that can be attached to any two of the bag’s four stainless-steel D-rings—use the two top rings for a vertical shoulder bag, two rings on the same side for a horizontal bag, or rings on opposite corners for a sling-style bag. This flexibility is a nice touch. (For an additional $20, MacCase will throw in a pair of backpack straps.) One complaint: some padding on the strap would have been welcome. The Vintage model I tested is quite attractive in a, well, vintage sort of way, indeed reminding me of a classic bomber jacket. The distressed leather looks good, and the bag’s white stitching complements that leather well. On the other hand, some people may be turned off by the embossed MacCase logo on the front and name on the back. The biggest downside of the Flight Jacket’s “sleeve with utility” design is of course that it doesn’t hold much; it’s a bag for bringing your laptop and just a few essentials. And because it’s made of leather, it’s not as light as many other sleeves: the non-backpack Vintage model I tested weighed nearly two pounds when empty. 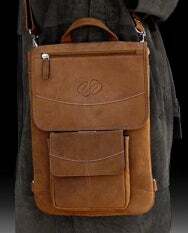 But overall it’s a unique and cleverly-designed bag with a great, rugged look.